PETALING JAYA: Some analysts and property consultants say the development of mega property projects in the nation’s capital, worth billions of ringgit, may provide abundant jobs for players in the construction industry, but note that these projects could be detrimental to the property market in the long term if not implemented properly, and especially if the take-up rates are slow. It is reported that mega development projects would take place at Dataran Perdana in Jalan Davis, the area surrounding Merdeka Stadium and the vicinity of the Matrade Centre in Jalan Duta. A property analyst with OSK Research said the mega projects, including the proposed 100-storey skyscraper near the Matrade Centre bordering Jalan Kuching and Jalan Duta, would negatively impact the property market. “The property market is still in an oversupply position, especially in the high-end sector in the Kuala Lumpur city centre,” he told StarBiz. The analyst said mega property projects like the proposed 100-storey skyscraper near Matrade should have due considerations to ensure satisfactory occupancy and take-up rate, and that they are built within the set timeframe to ensure return-on-investment targets are met. “The approved mega projects and proposed high-end mega projects are in decentralised locations that may not have the population and infrastructure to support the huge development,” the OSK analyst said. Although the area near Matrade has a certain level of affluence, as it is located close to Bukit Kiara and Sri Hartamas, it remains questionable whether the population, road access and infrastructure are sufficient to support the mega development. Another local property analyst said with the current property overhang, perhaps the priority should be to address the situation, especially unsold properties in the high-end sector. “We are not saying that mega projects should not go ahead in this current environment (property overhang), but they should be carefully selected and implemented to ensure these projects do not adversely impact the property market, particularly when the market is still recovering,” he said. Amy Chung notes that current demand for prime properties in the city is in the ‘affordable’ segment. Amy Chung, a real estate property agent who specialises in selling and renting prime properties in the Golden Triangle area in Kuala Lumpur, noted that the current demand for prime properties in the city was in the “affordable” segment, and the recent Dubai debt crisis had exacerbated the demand for high-end properties. “Even foreign investors from the Middle East are now opting to buy more affordable and smaller properties here,” she said, adding that some developers were now risk averse, choosing to build fewer high-end units and only in strategic locations where they were confident of sales. Chung said the property sector was market driven and developers and government planners of high-end mega property projects should take note of this fact. A local property consultant concurred with Chung, saying that any mega property project worth billions of ringgit must be well planned and carefully thought through. “Many of the prime properties in the city are bought for investment by individuals and institutions expecting attractive yields and favourable capital gains over time. “Currently, we still have an oversupply of prime properties, especially in the high-end segment, that do not give the expected yields. As such demand for such properties is low,” he said. And with more high-end mega property projects expected to come onstream, the current oversupply position would get worse and likely depress the prices of properties that are currently unsold and even affect rental prices, according to the local property consultant. “We believe there is a need to perform a comprehensive impact assessment on the Malaysian property market before any funds are used to finance mega high-end property projects worth billions, which may very well end-up as white elephants,” he said. He added that the fall in property prices in Dubai was a lesson for everyone, including Malaysia, noting that the prices of prime properties in Dubai had fallen 50% or more since the debt crisis. The property consultant also criticised the banks that had funded the Dubai projects, questioning whether they had performed sufficient due diligence on the commercial viability of the projects. PETALING JAYA: The secondary property market in the Klang Valley is expected to remain soft in the next three to six months due to an abundance of supply, according to property consultants and experts. “But (demand for) the better managed condominiums will remain unchanged as there will still be a market for this type of property,” he added. However, Thiruselvam said all the properties (in the Mont’ Kiara area) had seen a decrease in both rental and capital value this year. A real estate agent concurred that there was an over-supply of property, especially in the Mon’t Kiara area. However, she said rental rates for some locations in the Klang Valley were “more challenging” than others. “Selling prices in places like SS2 have been better compared with rentals. In the past five years, the rental rates did not grow as much as selling prices,” she said. She also said rental rates in selected areas in Mont’ Kiara and Kuala Lumpur city centre were better than others. She, however said there were some established areas, like Damansara Heights, where regardless of a downturn, selling prices still remained stable. According to Zerin Properties chief executive officer Previndran Singhe, rental rates for Grade “A” office space within the Golden Triangle area has been stable and is expected to improve towards year-end. Previn also said rental rates for commercial property would remain good in Cyberjaya. He also said the expatriate residential market was expected to remain soft until the first quarter of 2010. Financial services and property development group TA Enterprise Bhd's (TAE) third-quarter net profit fell more than half to RM17.58 million, due to lower contribution from its property business. Net profit for the quarter ended October 31 2009 dropped 54 per cent from RM38.2 million in the same period a year ago. Revenue was 16.6 per cent lower at RM118.2 million from RM141.7 million a year ago. TAE attributed the decrease in the group's net profit to the lower revenue from stockbroking and property divisions and lower gain on disposals of investments. The reduction in profit was, however, cushioned by the lower net provision for doubtful debts and impairment losses on investments. In its filing to Bursa Malaysia yesterday, TAE said it expects to perform satisfactorily for the financial year ending January 31 2010. The company said the current economic statistics show that the economy seems to be in the path of recovery. The relatively low interest rate prevailing in the market should support the economic growth and boost the activities of the financial market. However, the newly imposed Real Property Gain Tax of 5 per cent on gain on disposal of properties may impede the growth of the property sector, it added. PETALING JAYA: Newly listed TA Global Bhd has posted RM13.39mil net profit for its second quarter ended Oct 31. It recorded pre-tax profit of RM17.64mil, of which about 65% came from its property development arm, followed by property investment and hotel operations, it said in a filing with Bursa Malaysia yesterday. TA Global said there were no comparative figures in the previous corresponding period as this was the group’s first quarterly report on consolidated results in conjunction with its listing on the main market. It was listed on Nov 23. Revenue for the quarter under review was RM89.72mil while earnings per share was 0.37 sen.
PETALING JAYA: Genting Malaysia Bhd (GMB), formerly known as Resorts World Bhd, has proposed to acquire Wisma Genting in the heart of Kuala Lumpur and two parcels of lands in Segambut from parent company Genting Bhd for RM228.6mil. Under the deal, GMB will pay RM212.7mil to Genting to acquire the 25-storey Wisma Genting from Genting’s Oakwood Sdn Bhd. Meanwhile, GMB will pay RM15.9mil to acquire Genting’s 100% owned Genting Highlands Tours and Promotion Sdn Bhd, the owner of two parcels of adjoining develoment land in Segambut. Genting owns 48.65% of GMB. GMB, which occupies eight floors and two basement levels at Wisma Genting, said the acquisition would enable it to save RM3mil in annual rental cost and earn rental income of RM17.3mil from other tenants. The purchase of the property in Segambut would also reduce GMB’s rental expenses by RM300,000 a year, while offering it the opportunity for development in the future. In a separate statement, Genting said the disposals were consistent with the group’s intention of streamlining its Malaysian property investment and management activities under GMB. “The disposals are expected to be completed on Dec 11, 2009 at which time, Oakwood and GHTP will cease to be subsidiaries of Genting,’’ the company told Bursa Malaysia yesterday. HONG KONG: Asia’s property fund size will expand by more than 50% in the next two to three years to US$200 billion (RM678 billion), driven by demand from institutional investors from countries including China, industry executives said yesterday. Pension funds, sovereign wealth funds and affluent individuals would likely boost their portfolios for real estate funds in coming years after appetites waned sharply during the sharp economic downturn earlier this year, the executives told Reuters. “The next 12 months will probably be a bit slow because we are still coming out of this difficult global situation, but then I think it will pick up more quickly after that,” said Nicholas Loup, Asia-Pacific chief executive of UK-based private property group Grosvenor Ltd.
Asia’s fund managers have US$130.9 billion of property assets under management, based on a survey by the Asian Association for Investors in Non-listed Real Estate Vehicles, a non-profit organisation focusing on fund-related companies in the region. The current global property fund totalled US$409.6 billion, the association’s first-ever survey showed. Loup, who is also chairman of the association, said Asia’s fund size could easily top US$200 billion over the next few years, barring risks external to the region, such as debt problems faced by financial institutions in markets outside Asia. “The big sovereign wealth funds in the region, the Chinese insurance companies, will start investing, (and) you’ll see the Middle East looking more eastwards for their capital to be deployed,” said Willem de Geus, managing director for Morgan Stanley Asia. Morgan Stanley, Singapore’s CapitaLand and Australia’s AMP Capital, are Asia’s top three property fund managers, making up nearly 40% of the region’s total property funds, the survey showed. With growing appetites for property funds in Asia, Morgan Stanley is considering launching products aimed at institutional investors in potentially lucrative emerging markets. RESIDENTS of Kuala Lumpur have themselves to thank for the people-friendly budget announced by Kuala Lumpur City Hall. The 2010 budget was prepared based on opinions garnered from various residents’ representatives and NGOs. Kuala Lumpur mayor Datuk Ahmad Fuad Ismail added that the budget was also aimed at cutting costs for the DBKL (see accompanying story), with several reductions in administrative allocations. The surplus budget sees an increase of 2% from last year and about two-thirds of the money will be provided by the Federal Goverment. About half of the RM2,1bil surplus budget will be allocated for operations costs (RM1.102bil) that include cleanliness and beautification as well as upgrading various public amenities. A further RM1.07bil has been allocated for development costs and will focus on on-going projects, including those under the Ninth Malaysia Plan (9MP), the Economic Stimulus Package and the Special Flood Mitigation Project. There is also some good news for property owners as the assessment rates have not been hiked although DBKL has made plans to review the rates that have remained unchanged for the past 15 years. 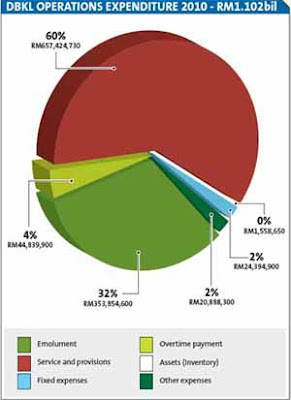 Assessments are still DBKL’s biggest revenue earners, contributing RM755.08mil to its coffers. Other revenues include building and planning permission payments (RM116mil), rentals (RM65.1mil) and licensing and permits (RM47.96mil). The DBKL also expects to receive RM451.3mil from the its assets, including the sale of DBKL flats. The Federal allocation will be channeled into 9MP projects (RM245.84mil), Flood Mitigation (RM71.34mil), the Economic Stimulus Package 2 (RM133.53mil) and Special Housing Allocations (RM236.97mil). For 2010, DBKL will also be receiving road and ITIS maintenance grants (RM68mil) from the Federal Government, which will also be allocating RM10mil for the management of properties not owned by DBKL like Istana Negara and government-owned vacant land. There is also a strong focus on ICT, with RM26.58mil planned for developing DBKL’s IT system to provide a better e-Licensing system and to develop its Digital Library. 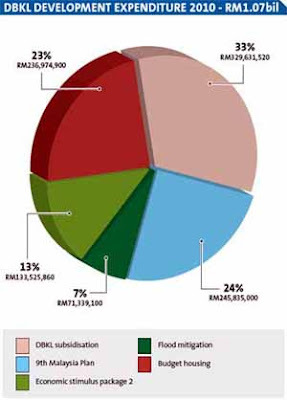 A total of RM239.37mil has also been allocated under the housing fund to sustain 48 projects. This includes allocations for consultants for the public house projects at Kg Wira Jaya, Kg Pandan Indian Settlement, Sg Udang and Kg Semerah Padi. However, Ahmad Fuad was disappointed with the negativity of the Kuala Lumpur Opposition MPs who had met with him on Friday to discuss the budget. He said they should be thankful that a large sum of money had been allocated to Kuala Lumpur. “The Budget is based on our capabilities and our ability to fulfil commitments from previous years. Isn’t it a good thing we have a bigger budget? “They should be happy and not compare it to Selangor’s budget. Otherwise, we can lower the budget next year to meet their requests,” he said in reply to an article published on Saturday. The mayor also said that the budget was only a guide to expenditure next year. “We do not have to follow it completely but it helps us plan our finances and work in a systematic manner,” he said. Ahmad Fuad also stressed that DBKL’s main target was to provide better service to the people. He added that this was the reason City Hall would launch a call centre using a system adapted from that used by the Public Complaints Bureau. He explained that the pilot project was part of efforts to build an effective communications system where complaints could be handled systematically. “There will be five officers at the call centre and they will channel all complaints to the relevant departments. “They will handle the situation and get back to the complainant within three days.” Ahmad Fuad said, adding that 20 officers would be appointed to the call centre. PARKSON Corp Sdn Bhd will spend between RM25 million and RM30 million in direct and indirect investments in its new department store at Setia Alam City Mall in Shah Alam, Selangor. The department store will be Parkson's first in Shah Alam. Greenhill Resources Sdn Bhd, the manager and marketeer of the mall, yesterday signed on Parkson Corp as an anchor tenant. The retailer will take up 120,000 sq ft of the mall's net lettable area of 700,000 sq ft.
Greenhill Resources is a joint venture between SP Setia Bhd, the country's biggest developer, and Asian Retail Investment Fund (ARIF). ARIF is managed by Lend Lease Investment Management Pte Ltd, a member of Lend Lease Corp Ltd, a fund management, property development, management and construction group. "I am confident that in three to five years, this store will be one of our top 10 stores (in terms of sales) in Malaysia," Parkson Retail Group managing director and chief executive officer Alfred Cheng told reporters after witnessing the signing ceremony in Selangor yesterday. Parkson Corp chief operating officer Toh Peng Koon said the group will continue to look at adding 15 per cent more space each year. This translates to two to three stores a year in Malaysia, three to four in Vietnam and five to six in China. "Parkson has recognised both the suitability of this location for a shopping centre of this nature and the scale of the current and future customer base. "This confidence will resound with retailers and will allow us to secure a retail mix that complements our positioning and customer desires," Greenhill Resources development director Robert Spinks said. Greenhill Resources looks to sign on between seven and eight more anchor tenants for the mall. Apart from the new Parkson store, the mall will include over 200 local and international specialty stores, a number of major anchor retailers, an entertainment precinct and a large park. Designed by the Lend Lease team, the mall will support SP Setia's vision for Setia Alam, which has over 20,000 new residents and is set to expand to over 50,000 by the time the mall opens. The new centre will also draw customers from a wider catchment area with a population of about one million people. "Parkson's proven success in the middle and upper-middle income segments of the Malaysian retail market complements the buyer profiles of both Setia Alam and Setia Eco Park," SP Setia president and chief executive officer Tan Sri Liew Kee Sin said.